Yeah!!! I know you’re all as excited as me that Pantone Colour of the Year have announced their Colour of the Year for 2016. You are excited aren’t you? Well, I know you might not be super duper excited (like moi) but you should be! The thing with The Colour of the Year is you’ll be seeing a lot of it, not just in interiors, but in anything that uses colour – so basically everything, fashion, design, art, homeware, cars, sportswear – literally everything that comes in a colour will at some point bring out a version in Pantone’s Colour of the year – that’s how it works…keep an eye out you’ll be amazed how many things you notice. And the extra doubly super exciting thing about this year’s colour – well, there are two of them: Rose Quartz AND Serenty. Or to the majority of us – baby pink and baby blue. And my oh my are they fab. The jury is still out as to whether my little brain can cope with the 2 together. In fact, at this point I actually can’t cope with them as a pair. But I love them each individually (a little like my toddlers…love them both, but together they can push me to the brink of insanity). So, for that reason I’m going to give you a little run down on both – but one at a time. Starting with Rose Quartz. Well its a pastelly, coral, muted pink and it looks a-m-a-z-i-n-g with grey and with white (yeah). It’s really easy to see how gorgeous and perfect for spring and summer Rose Quartz is going to be. The great thing about something like Colour of the Year though is its just a taster, or colour inspiration, that designers and makers can use to be “on trend”. It more a steer than a requirement, but what a good steer it is. I’ve decided that rather than matching Rose Quartz exactly I’m going to go more down the dusky/grey end of pink. I’m a giant fan of this beautiful door above. I’m not 100% but it looks to me to be Farrow and Ball “Pink Ground” or Little Greene Paint Company “Pink Slip”. You could go bold with pink paint – walls, doors, kitchen, bathrooms, go crazy. Or you could be a bit more subtle and just use Pink accents. Anything from soft furnishings to home accessories, the blush pink is so clever. It works gloriously with white and just feels fresh. Definitely a winner. This beautiful bed below was upholsted by Stenvall Interiors using the fabulous Sarah Hardaker’s Delphine linen (one of my all time favourite fabrics), closely followed by one of our bespoke Emily Bond Pink Guls lampshades. Perfectly Pink! And one of the best things about pink in the home – it goes with copper – and you all know how much I luuuuurrrrrve Copper! Whoop. So, if you haven’t worked it out yet I am pretty pro Rose Quartz. I love a bit of pink. 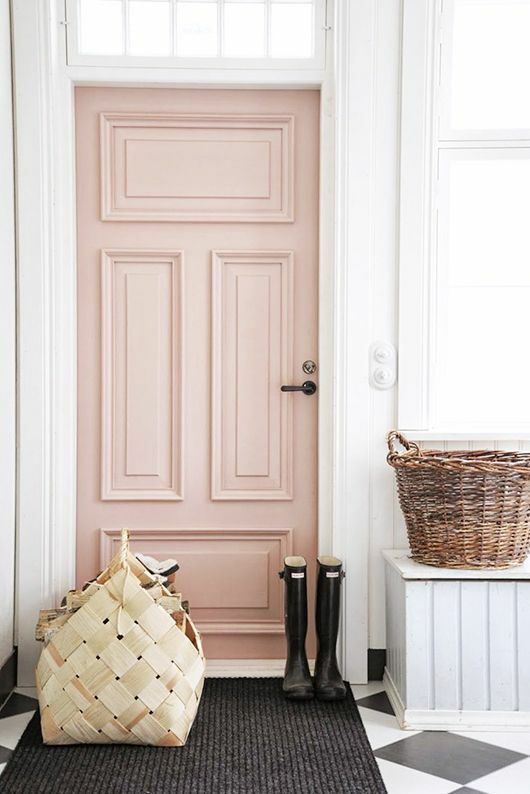 And I love the idea of people adding a hint of pink to their homes (or perhaps a whole lot of pink). I’m also looking forward to being able to focus on pinks in upcoming schemes – Sarah Hardaker does some gorgeous fabrics in pinks and they go beautifully with Konig Colour paints (which I’ve just found out about – blog post coming soon), I feel a collaboration coming on. Over the next few weeks I’ll be showing you how to use pinks in your contemporary country interiors – perfectly in time with spring. And of course I’ll be bringing you another post packed full of Pantone Serenity – a fabulous blue – if Rose Quartz isn’t your cup of tea, I’m sure Serenity will be!